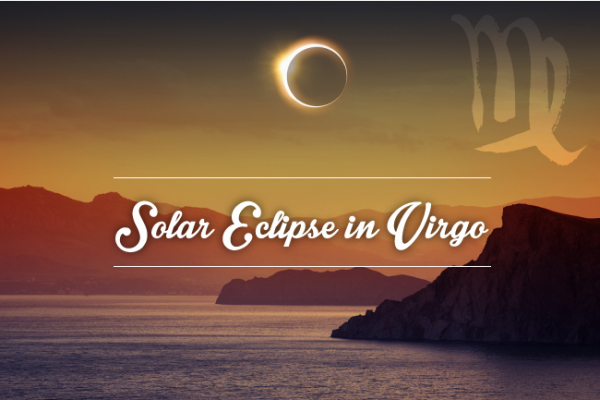 Solar Eclipse in Virgo September 1st 2016: Clean up your Act! A solar eclipse new moon in health-conscious Virgo on September 1st 2016 means it's time for you to clean up your act, i.e. streamline, de-clutter and simplify your life. With the ongoing Saturn-Neptune square involved, let what you no longer need be washed away and take steps to correct situations that have been ailing for some time. This process will allow you to walk with greater clarity and strength toward a brighter future. This is the second solar eclipse in Virgo in two years. The first Virgo new moon solar eclipse came last year in September of 2015. Think back to last September. What new concerns, places and faces showed up in your life? Who or what suddenly left your life? This current solar eclipse in Virgo is the second and final part of this process of renewal, elimination and realignment that began last September (there won't be another eclipse in Virgo for another nine years). If projects and people have started falling away already, this solar eclipse will finish this process off, setting you firmly on a brand new, healthier path. How does this solar eclipse in Virgo affect your zodiac sign? Read up on your star sign and Ascendant (or rising sign) and find out! If you don’t know your Ascendant, draw your free birth chart with us. If your life is at a major crossroads and you need a more personal reading call one of our expert psychic advisors on 0207 111 6384. Changes at work are in store - how, where and who you work with. Ask yourself: Does your job require you to develop new skills? Do you need to change your methods? This is a hectic time with deadlines and schedules brought forward. If it’s all systems go, think of it as training, helping you perfect your expertise. Glance at your weekly career horoscope if you need ongoing guidance. If it’s your health that calls for attention now, then this is a blessing in disguise, urging you to correct a situation before it’s too late. It’s not often you get to think about what makes you truly happy. This is one such rare and wonderful occasion! Yes, it may not be easy, but becoming clear in your heart as to what you want is the first step. Do you yearn for more love in your life? Is it children? Would you like to paint or learn to play the piano? Would you love to start your own business? Whatever it is, this eclipse opens the door. It’s up to you to walk through it. If it’s your love life that is all up in the air, why not get some peace of mind with your love life personal forecast? This eclipse brings major changes in your home, your family or your living situation. What or where is it that you feel safe? Where do you belong? What is your starting point in life and who are you really at root? These are important questions to ask now as the answers will be greatly revealing. You may also need to move house or country of residence. If you have been unsure as to whether you want a family of your own, events now will clarify the matter. Wondering what sort of parent you’d make? Meet the parents in astrology! A short trip or change of scenery that would normally have faded into insignificance opens your eyes to a whole new way of looking at things! Or it could be unexpected news that flicks a switch on. Or it could even be something that relates to a neighbour, class-mate, brother or sister. Everything around you seems to be changing - and fast - and you’re caught in the middle trying to find your bearings. Think of this eclipse as a compass, finally showing you due north. Check out your numerology life path number as you let the dust settle, to bring yourself back to who you are at core. You, dear Leo, rarely look like you lack self-confidence. And yet you may often feel insecure about your true worth. This eclipse brings revelations and removes blind spots that get in the way of a healthy self esteem. This may come in the discovery of a talent or a new source of income. It may be an operation that removes a blockage from your body or it may be time to de-clutter your attic. All of this will make you stronger. (Make the process easier on yourself by choosing the most optimal planetary hour.) Don’t worry about what falls away now. Make space for something new! Your life is undergoing major change for two years now, as events beyond your control are realigning you with your true purpose. Think: What is it that you want out of life? If you don’t know it’s time to find out. How? Through a process of elimination. And if you do know what you want, how much time do you spend actually doing something about it? If your days are filled with endless chores that do nothing to further your own aims, now’s the time to do something about it. Whatever passes out of your life opens a brand new door now. Walk through dear Virgo! Gain a fresh perspective with your Chinese Horoscope. This eclipse eliminates the last remnants of a past that you have actually long left behind. Let the tides take away what they will. You have already turned your eyes to a brighter future that you sense is in the making. If you work in a large corporation, expect important changes in the way the organisation functions. An encounter with fame, myth, the masses or the imagination may open your eyes now. Your finger is on the pulse and your intuition is spot on. Listen carefully! Seek further words of wisdom in your psychic reading of the day. You’ve been looking for your people for some time now - people you can share your goals and dreams with and who can walk alongside you in life. The ones you thought would be there with you may suddenly be falling away, leaving a gap. But if you lose a friend now or if a dream becomes obsolete, this will open the door to something new. This eclipse will help you find your people, opening a door for new allies to find you and new dreams to be dreamt. Strange dreams at night? We've got it all covered in our dream meanings. Where are you headed? Your career, reputation and public image are all in the hot seat. Major changes in the past two years mean that your life is taking a totally different direction than what you thought it would. Stop following this or that person in the know and take charge! Is it time to shed your old and dead public image like a snake sheds its skin? Is it time for a new Facebook pic? If your goals have all gone stale, eliminate what is obsolete and set sail for new shores. If in doubt as to what those are, a daily career tarot reading may switch a light on. Your future prospects are rapidly changing, helped by the fact that various barriers are being removed form your path, as if by magic, allowing you to move forward and expand to a more comfortable space. Whether you are acquiring new qualifications, expanding into new markets or feeling more hopeful and inspired in love, the point is that this eclipse is here to make your life more than what it was before. Let it all in! Growing faster than you can keep up with? Find out how to manage your personal growth in relation to the planets. There is something intently private going on with you and very few people, if anyone, seem to be party to it. This may be an intensely personal process of transformation, such as a new baby, a family crisis or an intimate relationship that changes you from within. Or it may be a business merger or other financial transaction that fundamentally shifts the way you function. This eclipse brings important realisations that empower you, helping you change and move forward. Experiencing trust issues? Find out all about the star signs, their relationship horoscopes and their biggest relationship threats. Has your relationship been through the grinder this past year? Are you even with a totally different person than you thought you would end up with? Now’s the time to gain a new perspective on things. What works? What doesn't? Is he or she truly the one for you? If someone leaves your life now it's for the best for both parties concerned. If there's still hope however, this eclipse reveals to you how you can set your relationship on a brand new, healthier and happier footing. Are you two truly compatible? Check for love horoscope compatibility based on yours and your partner’s particular date of birth!